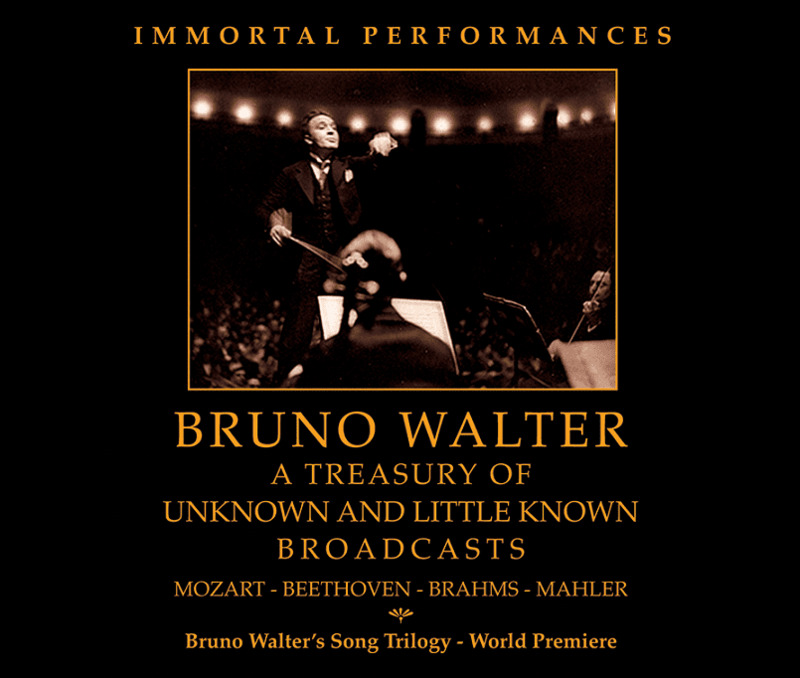 “A new Immortal Performances release, devoted to broadcasts of concerts led by Bruno Walter, includes performances that served as the basis for famous studio recordings as well as others that are independent of any commercial venture. All are worth hearing, and many are essential for a keener understanding of one of the greatest conductors of the 20th century. The four-disc set (priced as three) opens with a March 11, 1956 New York Philharmonic concert broadcast, part of the commemoration of the 200th anniversary of Mozart’s birth….The REQUIEM is on a very grand scale…a moving, powerful, and beautiful statement. Certainly the contribution of a sublime quartet of soloists (Irmgard Seefried, Jennie Tourel, Léopold Simoneau, and William Warfield) is one of the major factors, but so are the performances of the New York Philharmonic and Westminster Choir. …a December 19, 1954 New York Philharmonic broadcast of an all-Brahms concert opens with a blazing account of the Tragic Overture. I would recommend this performance to anyone who believes that Walter’s interpretations lack fire and passion. It is hair-raising, as this piece should be. The main work on the broadcast is the Brahms choral masterpiece, A GERMAN REQUIEM….As a musician, Walter certainly understood as well as anyone how to communicate the warmth and humanity of a musical creation. And from the very start, Walter elicits a beautiful, glowing sound from the orchestra and chorus….Walter favors very fleet tempos that generate a welcome and fresh sense of momentum, without ever seeming rushed. In addition, Walter encourages the chorus and soloists (the great George London and Irmgard Seefried) to deliver the text with the utmost clarity, thereby emphasizing the human, and perhaps even operatic, drama of this work…. … a superb account of ‘Ah! Perfido’, with soprano Eleanor Steber and the NY Philharmonic (April 15, 1949), is receiving its disc premiere. Beethoven’s concert aria is a highly demanding work, requiring a soprano who combines declamatory intensity, lyric beauty, mastery of florid writing, and a secure, powerful upper register. Steber, a marvelous and versatile artist, is equal to all challenges, and because of her technical mastery is able to throw herself completely into the musical and textual drama. Steber, Walter, and the NY Philharmonic are glorious artistic partners, in sync throughout. The cumulative result is thrilling, as it should be. …. [In] the February 20, 1936 Concertgebouw performance of the Brahms First Piano Concerto, with Vladimir Horowitz as soloist, Walter launches the opening movement with almost unbearable tension and focus, a reminder that Brahms composed this music in the wake of the attempted suicide by his mentor, Robert Schumann. But in addition to fire, there is lovely playing from the Concertgebouw strings, complete with tasteful portamenti. Horowitz’s entrance is masterfully executed, gently played and with fetching rubato, before resolving to his initial shattering outburst. In the remainder of the opening movement, Horowitz is a virtuoso force of nature, matched step for step by Walter and the Concertgebouw. All concerned are greeted by applause at movement’s close. Horowitz plays with breathtaking poetic beauty in the second movement, setting the stage for another volcanic performance in the finale. This may be the most electrifying Brahms First I’ve ever heard….As it is, all who love Brahms and this work should hear it. And finally, we have Walter and Mahler. I’ve written often in the context of my reviews of Verdi works conducted by Toscanini of the close relationship between the composer and conductor. In the case of Mahler and Walter, the relationship was even more profound. Walter, a young friend and disciple of Mahler, conducted the world premieres of both DAS LIED VON DER ERDE and the Ninth Symphony. And Walter proved to be a tireless advocate for Mahler during a time when composer’s works were viewed more as eccentric curiosities than music of great and singular value….on December 5, 1948, Walter and the New York Philharmonic gave a broadcast performance of the ‘Resurrection’ Symphony. That performance is the final major work on this set….In the finale, Walter, the great Mahler and opera interpreter, mines every bit of the drama inherent in music, leading to a choral finale that brought tears to my eyes and, I am sure, to many in the Carnegie Hall and radio audience. I suspect that Walter created many converts to Mahler that day. This is more than a great performance. It is precious historic treasure, a document of Bruno Walter helping to make Gustav Mahler a cornerstone of American symphonic repertoire. “If you are somehow still attached to the cliched view of Bruno Walter as the genial, soft-grained, gemutlich conductor practically exhaling whipped cream, just put on the opening of the Dies irae from this performance of Mozart’s REQUIEM and you will find your mind changed instantly. 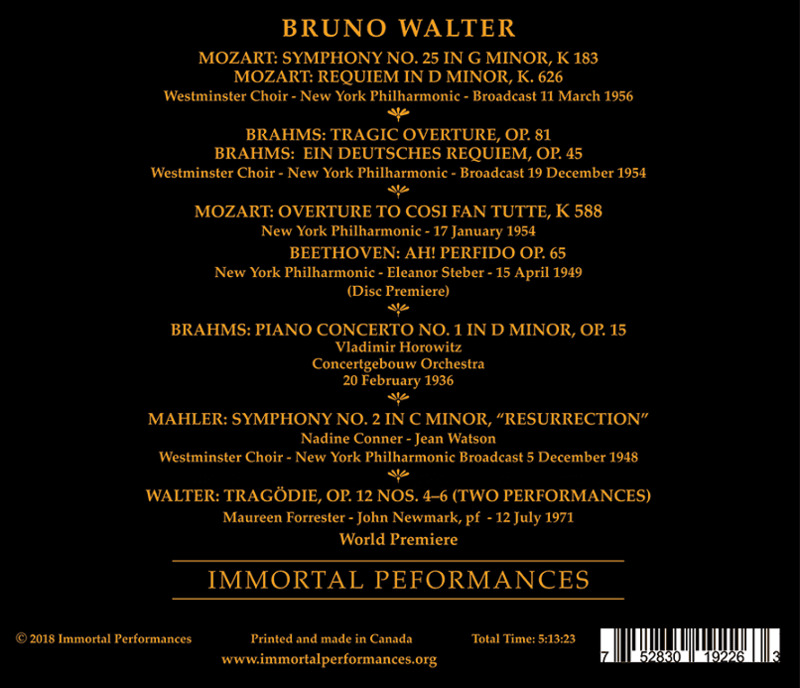 The entire first disc of this generously filled set features an all-Mozart New York Philharmonic broadcast concert from March 11, 1956….James A. Altena, in his superb accompanying notes, points out that there are seven recorded Walter performances of the Mozart REQUIEM….this performance has about it an electricity that is apparent from the opening chords. Choir, soloists, and orchestra all seem inspired by Walter to levels of reverence and conviction rare in performances of this music. There is a leanness of texture here that one doesn’t hear in other Walter performances, except for the studio recording. But this has an energy, a dramatic impetus and rhythmic firmness a few degrees beyond that studio version. The four soloists are magnificent. Irmgard Seefried’s pure lyrical soprano gleams, Jennie Tourel adds her rich alto to the texture, Léopold Simoneau’s sweet lyric tenor is a joy to the ear, and William Warfield exhibits a tonal solidity that serves as the foundation of the vocal quartet. This is one of those performances where you sense everyone knew something special was happening. If the live broadcast sound is not quite at the level of CBS’s studio recording, it is surprisingly close in Richard Caniell’s excellent restoration. A segment of Jim Fassett’s broadcast commentary is included to recreate the atmosphere of the original broadcasts, but is tracked separately if you wish to skip it. Brahms’ GERMAN REQUIEM performance is a very captivating and intriguing one….The two soloists are significant assets, particularly George London, whose rich voice is used with utmost sensitivity and who gives real meaning to the words….I find the sound here warmer and more natural, more open, than the studio recording in most respects, and the performance considerably preferable for its extra drama and conviction. Only at a few climaxes is there a hint of congestion. Next is something very important: a work new to Walter’s discography, and in a spectacular performance: Beethoven’s concert aria ‘Ah! Perfido’, sung brilliantly by Eleanor Steber in a concert on April 15, 1949. I know recordings of this difficult piece by Eva Marton, Gundula Janowitz, Maria Callas, Régine Crespin, Gre Brouwenstijn, and Aprile Millo. Steber is, frankly, superior to all of them in encompassing its huge vocal range with power and no sense of strain at either end….This gem is a true highlight of this set, even though it lasts just a bit over 12 minutes. Brahms’ First Piano Concerto with Vladimir Horowitz, from the Concertgebouw on February 20, 1936, is famous as one of only two performances of this work with Horowitz that survive, the other being conducted in New York by Toscanini in 1935….Overall, the performance is more similar to the Toscanini one than you might have anticipated. Tempos are quick, and there is an emphasis on virtuosity in the outer movements, where Horowitz is simply astonishing. The slow movement is wonderfully poetic, with the pianist and conductor exploring varying degrees of piano and pianissimo playing, and creating a magical atmosphere. Despite the fast tempos in the outer movements, the music never sounds rushed because of Walter’s weighty sonorities and Horowitz’s rhythmic firmness. 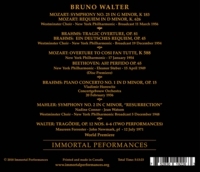 …a performance of Mahler’s Second Symphony from December 5, 1948 is in English….While both the studio recording and the live performance connected to it in 1957 have richer recorded sound than this, Caniell has done a magnificent restoration work for what seems to me to be by far Walter’s most dramatic and fiery Mahler Second performance to survive….Bruno Walter was, in fact, a man of the theater, and he brings this work to a close in a blaze of glory that clearly ignites an audience ovation at a time when Mahler was still a concert hall rarity….The lovely bonus is a group of three songs composed by Walter, sung by the great Canadian alto Maureen Forrester, in two performances (1971 and 1972) with fine accompaniments from John Newmark and Yehudi Wyner….Anyone who prizes the Lieder of Mahler or Strauss will find much to enjoy here.